For almost as long as my kids could hold books themselves, they have been part of the Summer Reading Program at the Madison Public Library. Each year, they mark off the number of minutes read each week on the tracking sheet (some years our summer reading was better than others...), and happily head off to the library to collect their earned prizes and raffle tickets. While at the library, we try to catch one of the many themed programs, and also hunt for Rosie, the stuffed animal mouse within the bookshelves to earn other raffle tickets. Though we've only participated in the Children's Department's Summer Reading Program in the past, this year, since my son is older and my husband and I also hope to up our summer reading, our family plans to be in all three programs offered -- the children's club for our daughter, teen club for our son, and adult club for my husband and myself! This year, the theme of the library Summer Reading Program is Build a Better World. This means that several of the programs and prizes for reading are based on the themes of building and STEAM (Science, Technology, Engineering, Art, and Math). The children's department's program is for Madison residents in preschool through grade 6, and has two main components: Summer Reading Club with reading logs for kids to track the time they read so they can earn prizes and raffle tickets, and age-appropriate events and activities. 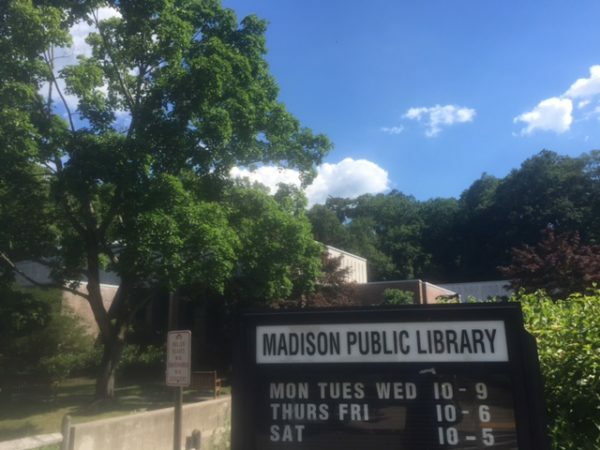 You must be a Madison resident to participate in the Summer Reading Club. The Summer Reading Program started on June 19, but your kids can still sign up to get started now. The Reading Club ends on July 31, but the activities continue through August. To register for the club, just stop by the Children's Department desk. There your child will receive a Summer Reading Log. Each week, kids color in a building for each 15 minutes they read. What counts as reading? Reading books, online articles, and magazines themselves; listening to audiobooks or someone read to you; and reading with a sibling or friend all count as minutes reading. Then they bring their Summer Reading Log back to the children's department to pick up prizes and raffle tickets based on how much they have read that week. The prizes this year cover all ages and interests: a Lego Star Wars kit, blocks with a board book, one month of karate lessons with free uniform and tshirt, craft kits, Elephant and Piggie books and stuffed animals, Empire State Building Erector set, and, what my daughter is hoping to win, a giant plush giraffe. Also, if your child completes two entire week blocks (41 fifteen minute reading buildings) they will earn a Super Reader lawn sign! To earn additional raffle tickets, kids can check out one of the specially-selected READ books in the front lobby book display, participate in any Pop-up Maker Activity, or attend a Star Program. The Pop-up Maker Activities are appropriate for ages 5 and up, and you can drop in any time from 3-5pm to participate. The remaining one for this summer are Maker Rafts (July 3), Finch Robots (July 11), Melted Beads (July 21), and Snap Circuits and littleBits (July 25). The Star Programs include drop-in music and animal programs held at the library, such as Mini-Mozart (ages 0-5; July 3 and 17, 10:30am), Rizzo's Reptiles (ages 4-10; July 24, 4pm), Touch the Music (ages 2-5; July 31, 10:30am), and The Butterfly Guy (families; July 31, 7pm). Other events, some of which you need to register for include the rhyme time, art for tots, Lego club, mini musical theater, build a plush animal craft, bubble activities, and woodblock printing. For the complete calendar and registration, click here. My son, who is entering 6th grade in the fall, is now past the stage of wanting stuffed animals and Lego sets. This will be his first year in the Teen Summer Reading Club, which runs through July 31. (I am still not ok with the fact that I am the mother of a middle schooler, but I guess I will need to get over that!) This program is open to students in grades 6-12 attending any Madison school (SVMS, MJS, MHS). For each item they read (book, eBook, magazine, audio book, graphic novel, or comic), they complete a ticket to get a small prize or book. Each ticket will be entered into a weekly gift card raffle (McCool's, Romanelli's, Stryxe Bowling Alley, iTunes), and all tickets will be entered into the grand prize drawing of a Kindle Fire in August. There are special programs for kids ages 10-13, including Sphero Robots (July 12, 2pm), paper mache and wire figures (July 19, 2pm), and upcycled jewelry (July 26, 2pm). For the teen yoga class (ages 10 and up) on August 9 at 2pm, you must register. For more information and to register for the programs, click here. Don't leave all the summer reading fun just to the kids! There is even an Adult Summer Reading Club! Madison adults, ages 18 and up, can fill in a ticket for each book they read to earn small prizes, enter into weekly raffles for gift cards (Drip, Gary's Wine & Market Place, Whole Foods, etc. ), and a grand prize drawing for $100 of Madison Bucks! Just be sure to turn in your tickets by July 31. Adult events include summer seminars and lectures on topics such as foreign policy, Milton Hershey, New Jersey inventions, mysteries, and the Met's Cloisters. Wednesday Night Film Nights show classic films about every other Wednesday at 7pm. For more information on the Summer Seminar Series, films, and other adult programs, click here. Madison Public Library is located at 39 Keep Street, Madison. (973) 377-0722 http://www.madisonnjlibrary.org/ The summer hours are Monday-Wednesday 10am-9pm; Thursday-Friday 10am-6pm; Saturday 10am-5pm; Closed Sundays in the summer.